It’s the beginning of December, which is the time of year that I start to fret about things like finding the perfect gift for Grandma, mailing holiday cards to loved ones, and helping my kids decide upon hand-made gifts for their siblings. You too? Time for both of us to take a deep, calming breath, because this block printing tutorial will take care of all our problems. Block printing looks a little intimidating at first glance, but trust me, it’s very intuitive. It’s a great way to get children and adults involved in creating art that can be produced in multiple originals. Though younger children won’t be able to cut their own blocks, they can create artwork and print with a little assistance. Older children (from about nine and up, depending on coordination and hand skills) will be able to complete a project alone, with some supervision. 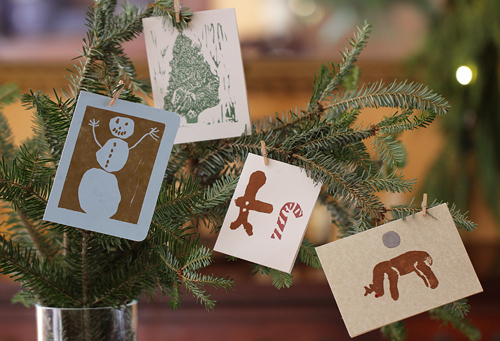 Your children can use these block printing techniques to design holiday greeting cards for friends and family, stationery sets as a gift for a teacher, or personalized thank-you notes. You will likely need to take a trip to your local art supply or craft store for some of these items, but the initial investment should only run around $20. Since block cutting is addictive, I’m sure you’ll find yourself using these tools again and again! -A pencil and paper, or a sharpie. -A large cutting board or self-healing mat as a surface for the carving. -A linoleum-carving handle and gouges. -A tube of block printing ink. 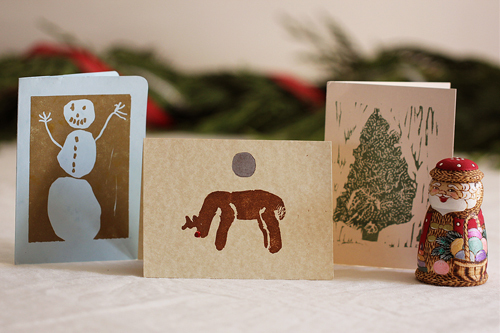 -Some high-quality paper, cardstock, or cards on which to print your block. The artist will begin by designing an image. Simple images without a lot of fine detail are best for beginners. The most basic way to prepare the design for cutting is to draw your creation directly onto the block with a pencil or a sharpie. If you use this method, remember that the image will be reversed when you print it. Another approach is to draw the image with a soft lead pencil onto a piece of paper cut to the size of your block, then transfer the design to the linoleum by placing the image face down on the block and securely taping it in place. Using the side of your pencil, rub the back of the paper until it’s completely covered, which will transfer the image to your block. You may wish to go over the lighter lines again, or trace the (now mirror-image) design with a fine-tip marker. – Always point the carving tool away from your body. – When you hold your block, keep your fingers and thumb away from the direction your cutter will be traveling (in case the gouge slips). – Cut on a cutting mat or large cutting board (if you plan to make block printing a regular craft, I highly recommend investing in a bench hook, which will help you hold your block in place; these can also be constructed with some basic woodworking tools. Another solution is to use the back of a wooden puzzle). Begin by cutting away some of the negative space around your design to get a feel for the tools and the resistance that the block presents. You will really just need two gouges for your linoblock cutting: the largest (number 5) and the smallest (number 1). 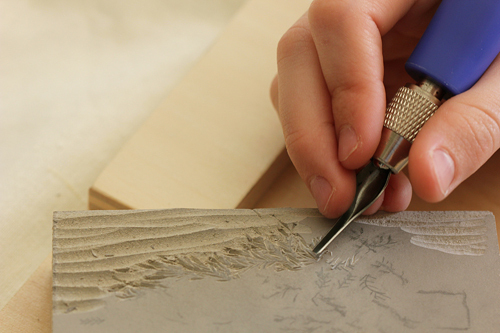 Use the large gouge to carve away big chunks of linoleum, and the smaller gouge for your detail work. The carving process is the longest and most attention-demanding part of the project. Depending on the detail of the drawing (and the age and skill of the carver), this could take as little as half an hour or as many as several hours spread over the span of many days. My ten-year old pecked away at her block for nearly a week, while I carved a giraffe that my five-year old drew in one sitting (it took me under an hour). Enjoy this part of the process! The carving is where much of the artistry comes in, and you’ll discover that what is printed from a carved block is often quite different from what was originally drawn on paper. 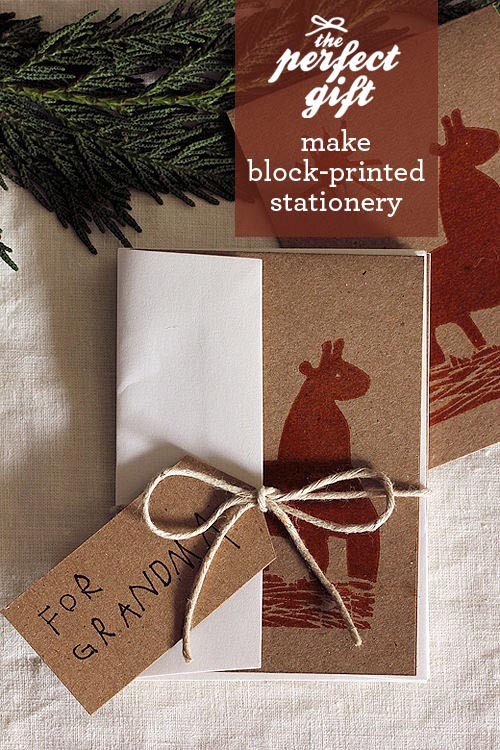 When your block is carved, it’s time to ink and print! Block cutting ink is water soluble, but very sticky. You’ll want to protect your clothing and the surface you will be printing on. 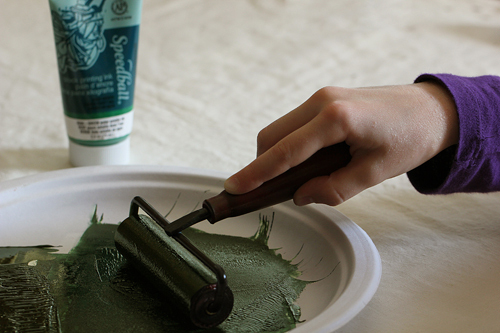 Place some ink on a smooth surface (we used a disposable paper plate for easy clean up, but wax paper or a sheet of plexiglass can also be used) and spread it out with the brayer. You’ll want to work and spread the ink until it becomes sticky, but be careful to lay out only a thin layer of ink – too much, and you’ll fill the smaller cuts in your design. You’ll know it’s ready when you hear a gummy, sticking sound as you roll the brayer through the ink. 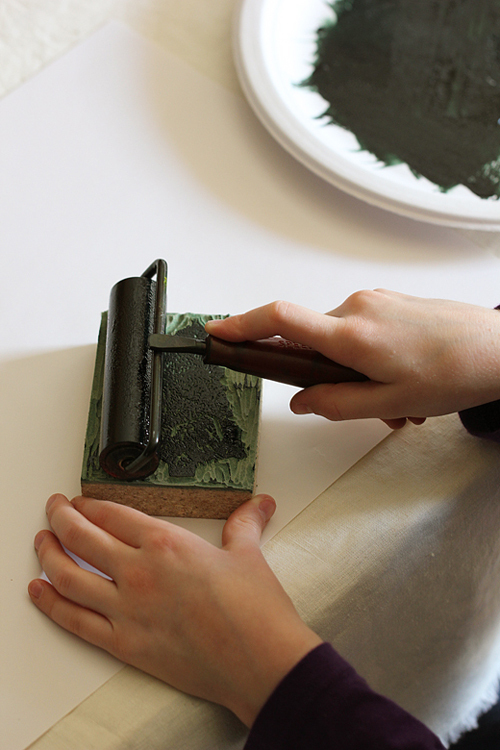 To ink your block, gently roll the inked brayer over the raised surface. Try to keep the brayer parallel with the surface of the block, and run it lightly along the surface; you don’t need to apply pressure. Roll horizontally and vertically to make sure you have coverage over the raised surfaces of the block which will print. To print, gently position your card or paper on top of the block in a single motion. Try not to shift the paper as you are placing it down, which would smear the ink over the sheet and ruin the print. 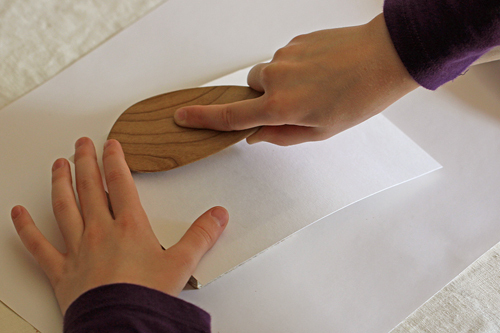 While holding the paper in place with a few fingers, firmly rub the surface of the paper with the back of the wooden spoon. Be sure to work the convex surface over the full block multiple times; if you’re careful, you can sneak a look at the paper by lifting a corner, but be careful not to shift the sheet in case you need to keep rubbing. Ta da! You now have a beautiful print of your work, and the luxury of being able to print it again and again! With a little care, you can print in multiple colors by using the brayer with different inks on various areas of the block, as we did with the Rudolph print above. Kids can even paint or color the finished print. – Cut a larger block and frame the prints as gifts for grandparents. – Use this book-binding tutorial to make a notebook with a block printed cover as a gift. – Make block printed Valentine’s Day cards or birthday party invitations. – Make a set of cards for a pen pal. There is a product called speedy-cut. It’s basically a sheet of eraser like material. My 4 year old can carve his own blocks using regular lino-cutting tools on the speedy cut . It’s very soft and your end product is like a big rubber stamp. You can mount it on a piece of wood if you want it to be less bendy for the printing process. I’ve even used small rectangular white erasers to make little rubber stamps. 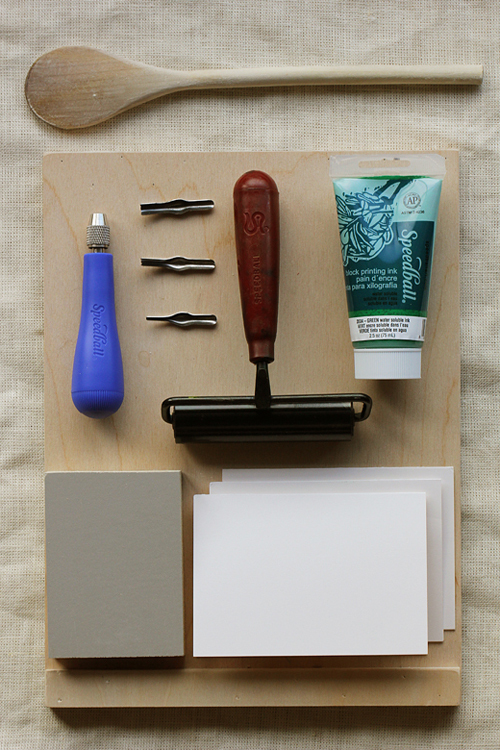 It’s a great way to teach the proper way to hold and use the tools since you need far less pressure to carve than a traditional lino block. Great tutorial. I’ve seen speedy cut, but never tried it. Sounds like it would be perfect for my 5-year-old’s little hands! Thanks so much for the tip, Stacia. Gorgeous idea! I love personal things! Inspires love and care. Certainly we will try it! The personal aspect is one of my favorite things about block prints, too. Enjoy the process! This is such a great idea! I love pretty things like them— especially when the kids can be involved in it too. Thanks for an awesome tutorial! Thanks, Jen! My kids love being involved in crafts like this — and my boys love that they get to use tools! Lovely, lovely tutorial! I’ve always been so drawn to–and a little afraid of–trying printing. This would be a great start. I love to think what our boys would choose to design! Thanks so much, Amy. It took some cajoling to convince our boys that Grandma does not want robot stationery for Christmas and that our friends do not especially want Lego-themed Holiday cards in the mail. . .
oh…but i bet they would really love it. capture this stage of their lives and you won’t regret the year where your boys made robot stationary and lego themed Christmas cards! Don’t worry, Heidi, the robot and lego block prints are already in progress — we’re just saving them for Valentine’s Day and a special birthday present! LOVE these cards. No adult hand can out-do the genuine, child artist. What a wonderful, clear tutorial!!! Thanks for sharing! 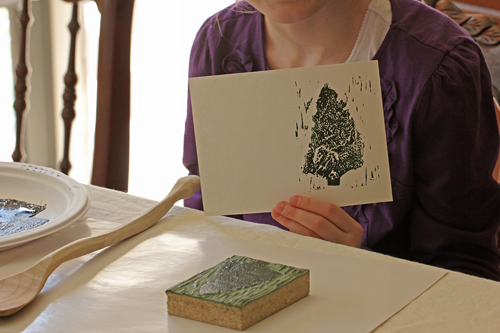 I also think that my kids would love to try their hands at this type of printmaking. It would give me an excuse to buy all the supplies so that I could dabble as well. Be careful, Melissa, it’s addicting! I love these stamps! I really want to make one for our christmas cards! Thanks for the idea!